The National Stroke Association has announced it will join the U.S. Mint in celebrating the launch of the new John Quincy Adams Presidential $1 coin on Thursday, May 15. One of the great values in coin series with ongoing themes and multi-year designs, like the Presidential $1 coins, is the educational value they can provide. The release of the John Quincy Adams coin this month honors his life, and just as importantly, is a learning opportunity. Like now. What many people may not know is that John Quincy Adams suffered a stroke on the floor of the House of Representatives in 1848. He died from that stroke two days later. How many people knew or remembered that from their day’s in high school? Likely, few. But now more can. "We are so pleased to join with the U.S. Mint during the release of this coin because it once again helps us to bring the issue of stroke to the forefront of the nation and empower stroke survivors, caregivers and the general public to prevent stroke and take emergency action when stroke occurs." “So much has changed in the world of stroke, especially in the past three years. We now have an easy FAST way to recognize stroke symptoms and stroke center hospitals that specialize in the latest stroke care…"
F = FACE – Ask the person to smile, does one side of the face droop? A= ARM – Ask the person to hold both arms outstretched, does one arm drift downward? S= SPEECH – Ask the person to repeat a simple sentence, does the speech sound slurred? 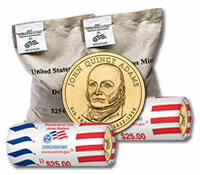 Will more people learn about FAST because of John Quincy Adams and the new $1 coin? For sure. Orders may also be placed via the Mint’s toll-free number, 1-800-USA-MINT (872-6468).